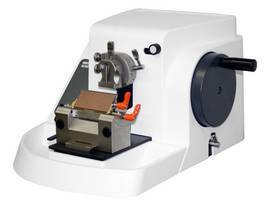 The Microtome M380 is designed to meet multiple requirements of histology or histopathology labs. It is also suitable for the use in research labs as well as industrial quality assurance. In being manual, the Microtome M380 is flexible to use at any place in the laboratory. With its high-precision mechanics inside, the Microtome M380 permits quality sections, while maintaining a high, consistent throughput. Great functionality and the appealing design are the key features of our microtome. Optimal user comfort enables a rapid, safe and smooth sectioning, even under heavy workload. The integrated sectioning waste tray is resistant to xylene, and can be detached for cleaning.